For this customer, we created an Online Obituary Archive, Calendar of Services, Individualized Guest books, and an online Memorial Video Option. All of which have been completely customized for the client's specific needs. 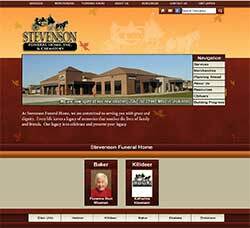 We at Stevenson Funeral Home are extremely pleased with the response to our company’s web site along with the working relationship we share with Custom Data. Family members and friends that are unable to make it to the funeral services are allowed to share condolences while being miles away. From the very beginning everyone at Custom Data has been a pleasure to work with and the support in maintaining our website is exceptional. They listened to what we wished our web site to be and came back with samples, extra options along with keeping us fully informed in each step. We highly recommend any company to visit with them regarding their web site - the feedback and working relationship you will develop is that of a lasting friendship.